This sarafan is for girls 2-10 y.o. The Russian costume consists of a white silk blouse with ornaments and sarafan. Such handmade Russian sarafan was a traditional outfit for Russian women in 18 - 19 centuries and still worn by Russians today at holidays and special occasions. 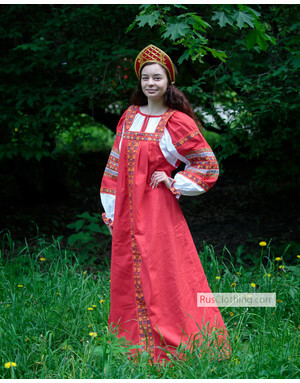 Russian sarafan dresses presented at Rusclothing.com are used for dance performances, ballets and theaters as well as on weddings and folk holidays occasions. All our traditional costumes are handmade and can be custom designed for any specific show. 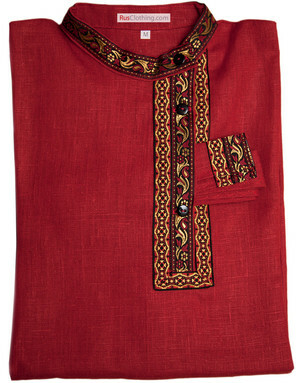 The pattern and style of this sarafan dress keeps old traditions and embroidery signs. 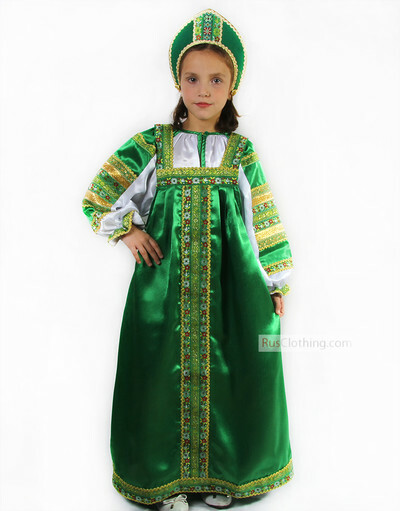 Red, blue, green, white, yellow - folk Russian costumes color range is rich and various.